Hard work, dedication to education, and a love for numbers has helped shape Maria Anguiano her entire life. Raised by a single mother in National City, just seven miles from the Mexican border, Maria was taught that education could transform lives, and that it did. While on a full ride scholarship to Claremont McKenna College, she met a teacher who helped show her all the opportunities that were possible with higher education. After graduating with her Bachelor’s of Arts degree and working for a few years, she went on to attend Stanford Business School, one of the top institutions in the country. Dedicated to rounding out her financial skill set, she knew exactly where she wanted to be when she graduated, Lehman Brothers. Though the firm was not recruiting for her position on her campus, she did not let that stop her. She did the research and cold called the person in charge. The risk was worth it as she ended up with an internship in New York that led to a full time position in the San Francisco office and mentor for life. Maria stayed close to her mentor, Peter Taylor, as he shifted careers and became the Chief Financial Officer of the UC system. Her relationship with her mentor and the financial skills she had acquired throughout her career led her to be poised for a position on his team as the Director of Strategic initiatives. “I feel like I’ve taken a lot of risks,” she explained. Whether it was cold calling to get a job, moving to New York or taking an initial 50% pay cut to change industries, she knew that the risk was worth it if it meant doing something she for which she had passion. Through her network, she learned about HOPE and the HLI program. For her, HOPE was her way back to the Latino community. After a career in finance and away from her family she looked around and realized that she was missing a connection to her Latina roots. “HLI felt like I found a family, other women who cared about California, about Latina empowerment, and about economic and political equality. It really changed my life,” she said. Today Maria is making an impact as the Vice Chancellor for Planning and Budget at the University of California, Riverside where of their approximately 22,000 students 60% are first generation Pell Grant recipients and 30% are Latino. Her primary responsibilities include supporting all aspects of the Riverside campus’ capital and financial plan and the planning and budget process. This position has given her a seat at the table and allows her to help make strategic decisions on how the University can best use its limited resources. 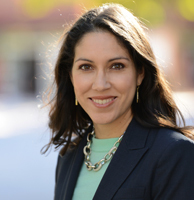 A recent appointee to the James Irvine Foundation Board of Directors, a $2 billion foundation that helps California’s working poor, Maria sees another great opportunity to make a difference in the community. “I am really excited to be able to have a voice and help inform the evolution of their strategy over the next few years,” she explained.